“This contract is a testament to the quality and technical expertise of our Engineering Services team and their ability to provide innovative solutions for extremely complex system design requirements. We are very excited about the award of this contract and the opportunities that it will provide for our shareholders and our employees,” stated John Poindexter, Chairman and CEO for BlackHawk. LAFAYETTE, LA June 13, 2018 - BlackHawk DATACOM is excited to announce a large multi-site contract award to secure 754 wind turbines for a major energy provider at eight wind power generation facilities encompassing tens of thousands of acres of land in Texas, Nebraska, California, Illinois, and Kansas, as well as the wind division’s main office. Physical security standards development for power generation facilities is the Critical Infrastructure Protection (CIP) Committee’s directive, carried out under the North American Electric Reliability Corporation (NERC) CIP guidelines to protect the electrical subsector of the United States. When the energy provider knew they needed to meet the NERC CIP guidelines, it was time to partner with BlackHawk DATACOM for the proper access control lock solution. BlackHawk DATACOM has embarked on the project to install the Medeco XT cyber lock system at each facility. Medeco XT is an electronic locking and intelligent key system that provides access control when paired with the Medeco XT software suite, a robust set of programs with backend programming, scheduled access, audit reports, and data dashboard. BlackHawk DATACOM was awarded the physical security project, to install over 2,000 cyber locks, in May 2018. BlackHawk DATACOM designs installs and maintains innovative technology solutions that help customers “Connect, Protect and Optimize” their critical infrastructure assets. The communications, physical security, and process automation products are specifically designed for operations in remote, harsh environments. Operators in the oil and gas, maritime, and utility industries that provide critical services to millions of customers—who can’t afford the loss of service or downtime—rely on BlackHawk DATACOM for a host of installed solutions and managed services. With Regional Operations Centers located in Port Fourchon, LA, Houston, TX, San Antonio, TX, Midland, TX and our 24x7 hardened Incident Command Center located in Lafayette, LA, BlackHawk DATACOM is strategically positioned to support critical operations. BlackHawk Datacom, a highly-specialized provider of telecommunications, security and process automation solutions to the Oil & Gas, Maritime and Utility industries announced today its partnership agreement with Tampnet. This partnership will enable BlackHawk to leverage the advantages of offshore 4G LTE connectivity for next generation solutions for their customers. Tampnet, Inc. is in the process of building a cutting edge, full scale carrier grade 4G/LTE system in the Gulf of Mexico. The LTE network is being built on a high-speed, low latency backhaul infrastructure consisting of 1200km of subsea fiber and approximately 60 high-speed, offshore grade microwave links. The network is built on the same model as in the North Sea, where Tampnet has a proven record of offering reliable offshore network services for 16 years and LTE services for the last 4 years. 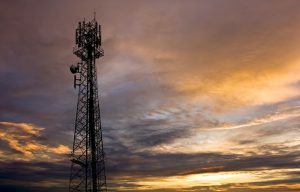 In March, Tampnet announced that it has reached 25% of its planned coverage for the Gulf of Mexico region. Today, this figure has passed 30%. On completion, estimated around mid-2018, Tampnet will have 60+ base stations operational, covering nearly 96,526 square miles and 98% of all manned offshore assets in the GoM with 4G LTE service. This includes the deep-water region, as well as, significant overlapping coverage for increased redundancy. *Areas outlined in blue showing existing coverage vs coverage when completed. BlackHawk’s commitment to helping their customers “Connect, Protect and Optimize” their critical infrastructure assets is largely dependent upon high speed, low latency digital communications. Lowering lift costs, increasing safety and security and ensuring crew morale become achievable goals when highly reliable digital connectivity is coupled with the latest technologies such as downhole and sub-surface HD video, machine learning, IIoT and other Big Data applications. Tampnet’s LTE network is an enabler for these technologies and many more. Tampnet operates the largest offshore high capacity communication network in the world and serves more than 240 O&G platforms, Floating Production Storage and Offloading units (FPSOs) and exploration rigs in the GoM, as well as on the Danish, Norwegian and the UK continental shelves of the North Sea. In total, Tampnet owns and operates a redundant offshore infrastructure network based on 2,500km of subsea fiber optic cable in the North Sea, complemented with a large number of high-capacity, carrier grade radio links and a high number of 4G base stations. 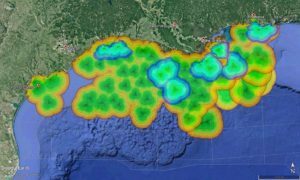 Tampnet is now in the process of building a similar core infrastructure and 4G LTE infrastructure in the Gulf of Mexico. BlackHawk Datacom the leading provider of innovative technology solutions for the oil and gas industry, announces the launch of DataMAX High Speed Wireless Network Solutions for the US onshore shale plays. This launch is the result of 35+ years designing, building and operating carrier-class infrastructure both onshore, offshore and around the globe. In addition, DataMAX technology can be of significant benefit to oil and gas companies who own and operate their own networks. Real-time analysis of network traffic using DataMAX gives operators the ability to route non-critical traffic to lower cost carriers providing increased reliability and an improved user experience on the business network. With route redundancy to improve network reliability, least cost routing to lower costs and availability anywhere oil and gas companies are operating, DataMAX is changing the way business is done in a very dynamic and increasingly competitive oil and gas industry. BlackHawk Datacom provides innovative technology solutions that help our customers “Connect, Protect and Optimize” their critical infrastructure assets. Our Communications, Physical Security and Process Automation products are specifically designed for operations in remote, harsh environments. We focus on operators in the Oil and Gas, Maritime and Utility industries that provide critical services to millions of customers who can’t afford loss of service or down time. We support these operations with highly trained personnel from Regional Operations Centers located in Port Fourchon, LA, Houston, TX, San Antonio, TX, Midland, TX and our 24x7 hardened Incident Command Center located in Lafayette, LA. Crime doesn’t pay. Everybody knows that. Reporting crime, however, does. The Energy Security Council (ESC) is a professional, nonprofit organization comprised of oil and gas operators, energy service companies and law enforcement. ESC’s Energy Crime Stoppers was introduced in 2008 as a Texas initiative, working in tandem with the Texas Crime Stoppers program. “ESC’s Energy Crime Stoppers hotline is a proactive way to attack and reduce theft and fraud in the energy sector,” said Tracy Poindexter, Energy Crime Stoppers chairman. On average, Energy Crime Stoppers receives 10 to 12 tips each month from energy company employees and the general public, paying callers as much as $1,000 for tips that lead to convictions. All tips are confidential, with rewards funded by donations from oil and gas operators. Since its founding in 1982, ESC has grown beyond Texas to include 950 members representing 165 member companies. In response to demand from its members, the uniquely focused Energy Crime Stoppers program has expanded in recent years to Louisiana, Oklahoma, Colorado, Arkansas, New Mexico, Utah, Wyoming, Pennsylvania and Ohio. The ESC differs from other trade organizations, Poindexter said, because of its ongoing strong relationship with federal, state and local law enforcement agencies. “We typically conduct free training to 1,000 law enforcement officers each year and partner closely with them in helping them understand and protect the energy sector, especially in the high energy-producing states,” he said. About 20 percent of ESC’s members are from the law enforcement community. ESC’s Energy Crime Stoppers program strives to be a significant player in the reduction of energy sector crime. The second goal is to continue to expand the program’s footprint. In addition to leading ESC’s Energy Crime Stoppers since early 2015, Poindexter also acts as director of sales for Lafayette, Louisiana-based Blackhawk Datacom, a technology innovator for the energy, defense and maritime industries. The recent drop in oil prices and resulting constriction of the upstream oil and gas market has sparked a rise in oilfield crime, he said. “Often people who have been negatively impacted by the leaner job prospects turn to unscrupulous methods of supplementing their income,” Poindexter said. “Obviously, now more than ever, the companies operating in the field cannot afford to sustain losses due to theft or fraud. For more information, visit www.Energysecuritycouncil.org, or call (888) 645-TIPS (8477) or (281) 587-2700. BlackHawk Datacom Teams with Infrastructure Networks, Inc.
BlackHawk Datacom (BlackHawk), the leading provider of innovative technology solutions for the oil and gas sector, has partnered with Infrastructure Networks (INET) to pilot a commercial grade LTE system in the Gulf of Mexico. This pilot deployment stems from the success of BlackHawk and INET providing high speed, low latency connectivity in the major US shale plays, and will provide an opportunity for offshore and maritime operators to experience a technology never before offered in the Gulf. John Poindexter, CEO of BlackHawk, said, “Our customers continue to take a more strategic approach in how connectivity is handled for their remote operations. Providing LTE coverage to operators in the Gulf will enable the flexibility, speed, and security needed to run more advanced applications – all at more economical rates than traditional communications.” BlackHawk management will be leveraging over 40 years’ experience working in the Gulf to provide the engineering, construction, and testing of several LTE based applications during the pilot. INET plans to begin establishing substantial LTE network coverage over a wide area of the Gulf of Mexico upon the successful completion of the pilot LTE project. This industrial LTE service has been highly anticipated by many companies striving for a more reliable, efficient and economical way to connect to their remote assets. BlackHawk Datacom is a dynamic, innovative and successful Energy, Defense and Maritime industry communications provider. We offer a broad array of satellite, broadband wireless and two-­‐way communications solutions designed to help our customers successfully communicate with their remote field operations. Our mission is to provide integrated Information & Communication Technology (ICT) solutions for companies with mission critical field operations in remote and often harsh environments. Founded in March of 2011, Infrastructure Networks provides next-­‐generation wireless broadband communications founded on 4G LTE wireless technology focused exclusively on critical infrastructure industries. Since its founding, the company has been rapidly expanding its network in the Bakken Shale in North Dakota, the Niobrara Shale in Colorado, the Eagle Ford Shale and Permian Basin in Texas, as well as the Texas Panhandle and in Kern County, California. 13-Jan-2015 Energy Security Council (ESC) Board Chairman Rob Ream announced to the membership they were seeking a volunteer to help lead the Energy Crime Stoppers program. After the Fall meeting was over, four different members spoke to Rob and volunteered for the Energy Crime Stoppers leadership role. Over the past 5 weeks they visited with and evaluated the four volunteer candidates and are most pleased to announce they have selected Tracy Poindexter, Director of Sales with BlackHawk Datacom to be the new Energy Crime Stoppers Chairman. The Chairman of the Energy Crime Stoppers program will report into the ESC Board via the Chair of the LELC (Law Enforcement Liaison Committee). If this person is unavailable, the Executive Director of ESC will function as the liaison on behalf of the Board. BlackHawk Datacom (BlackHawk), the leading provider of innovative technology solutions to the oil and gas sector, announced that it has opened two new locations to better serve customers. The expansion includes a Houston office, equipped with a full service center as well as a corporate sales office. The new site accommodates BlackHawk’s rapidly growing sales force, facilitates access to corporate customers, and complements established service centers supporting the Eagle Ford and Brazos Valley regions. Williston, ND joins Houston as the latest service center added to the growing BlackHawk presence. “Customer demand has been the primary motivation for opening a location in the Bakken Shale”, said John Poindexter, CEO of BlackHawk. “Our focus on last-mile innovation, like well site security solutions, has been at the core of our growth. Simply providing connectivity no longer has the same value to operators it once did.” These expansions further secure BlackHawk as the leading provider of technology to enable the digital oilfield. Their strategic approach to solutions for mission critical operations falls hand-in-hand with the direction the oil and gas market is headed. Access control, video surveillance, and traffic management are just a few of the applications offered as part of the lifecycle of an oil well, field, or region. Headquartered in Lafayette, LA, BlackHawk helps maritime, energy, and government organizations by providing innovative technology solutions for mission critical operations. Additional information isavailable at www.blackhawkdc.com. 07-Jul-2014 Datacom, LLC has secured a capital investment in the Company of $19.2 million led by Main Street Capital Corporation (NYSE: MAIN) (“Main Street”). The initial investment proceeds were used to complete a minority recapitalization, refinance existing debt and provide working capital for growth in Datacom. In addition to the initial investment, Datacom secured an additional tranche of growth capital totaling $13 million through the Main Street-led facility to expand its current business lines and make acquisitions. Datacom’s management team retained majority equity ownership in Datacom. Its leadership consists of veteran energy telecommunications and engineering managers who have a combined 175 years of experience in the field. Datacom was assisted in its selection of a capital partner and counseled throughout the transaction by Bruce Bown of Dancing Bear Resources, LLC. Datacom has over 30 years experience designing, implementing, and supporting communications solutions for operators on land and water across the globe. These offerings are engineered to provide mission-critical communications for every phase of the well lifecycle. The Permian Basin center is the latest addition, expanding the service already available in other major US shale plays. Datacom announced the acquisition of North East Texas Communications (NETCOM) in order to expand their presence in major shale plays across the continental United States. John Poindexter, CEO of Datacom, added “Every day we are seeing technology becoming more integral to the success of oil and gas operators. The pursuit of real-time information to make decisions about their business drives increased IT requirements to accomplish this goal. Our innovative solutions help customers succeed in this endeavor, which falls hand-in-hand with NETCOM’s history of commitment to adapt and respond quickly to their needs“. Datacom helps maritime, energy, and government organizations better communicate with remote assets by providing tailored and scalable solutions. Headquartered in Lafayette, LA, Datacom’s mission is to provide integrated Information and Communication Technology (ICT) solutions for companies with mission-critical field operations. Datacom, a leading provider of mission-critical communications to the maritime, energy, and government sectors, announced that it has opened additional communications service centers to support multiple shale plays. In addition to service centers in the Eagle Ford, Haynesville and Niobrara, local support will now be available for Marcellus, Barnett, and Permian Basin operators. A second Eagle Ford center near San Antonio has also been opened to further meet customer demands in that area, complementing the existing location in Corpus Christi. Whether it’s satellite, broadband wireless, or terrestrial platforms, these local support centers provide Datacom’s customers with increased reliability for mission-critical field communications. “Working with oil and gas companies for the past 30 years has engrained how important responding quickly to customers’ needs are”, said John Poindexter, CEO of Datacom. “Our expansion of service centers into these high demand areas provides local support expertise at lower costs, resulting in increased productivity for operators”.